There’s a plan afoot here in Red Wing that strikes me as one of the more bizarre ideas, particularly given the subsidy the City of Red Wing is giving to Xcel Energy by leasing land from Xcel Energy for the term of Xcel’s own “ash mining” project and about 10 years beyond. WHAT? On Monday, the Pollution Control Agency will release the EAW and you’ll be able to find it HERE AT THIS LINK. Community Meeting to Share Information About Proposed Project to Process Ash and Recycle Metals from Xcel Energy’s Red Wing RDF Landfill – December 7 | 5PM-7PM | Red Wing Public Library. Please join Lab USA and the City of Red Wing for a community meeting to learn more about a potential project that would process ash and recycle metals from Xcel Energy’s RDF landfill in Red Wing. Lab USA has proposed to build, own, and operate an environmentally-responsible ash processing facility that would be located next to the existing Xcel RDF landfill in Red Wing. The project will recover and recycle high quantities of iron and non-iron metals from ash in the landfill that was created by Xcel Energy’s Red Wing Generating Plant and from existing ash at Xcel Energy’s RDF landfill.The community meeting is another step in Lab USA’s ongoing work to secure permits and approvals and to reach out to the Red Wing community. * Lab USA has completed a voluntary Environmental Assessment Worksheet (EAW) that shows the project will comply with rules and regulations related to noise, emissions, and other impacts. * People from Lab USA, Xcel Energy, and the City of Red Wing will be at the meeting to answer questions and talk about the project, how the ash processing works, and how this project can benefit Red Wing. This project is also a unique way for Red Wing to take its commitment to sustainable environmental stewardship to a new level by creating both economic and environmental benefits for City of Red. It will remove and recycle metals from the landfill, generate new revenue for the city, and create jobs as the project moves forward. To be clear, the Monday meeting is hosted by Lab USA and is an “open house” format and is not a formal hearing. The public comment period is for 30 days, until January 4, and I’l publish details on where to send the comments after the Notice is issued. After January 4, 2017, there will be a determination of whether an Environmental Impact Statement is necessary, and remember, in recent history, the MPCA Board has only ordered ONE EIS, and after that one EIS, the MPCA Citizens Board was unceremoniously disbanded! The odds of a declaration that an EIS is needed are zilch, zip, nada, ZERO. Kevin Kain is the environmental review project manager for the proposed Lab USA project. The reason you couldn’t find the EAW on our website is because it hasn’t been placed on public notice yet. That will occur next Monday Dec 5, 2016 which starts the 30 day public comment period. You will find EAW posted next Monday at the bottom of https://www.pca.state.mn.us/quick-links/environmental-assessment-worksheets-and-environmental-impact-statements under Environmental Assessment Worksheets. The company will be hosting an Open House and Kevin along with other solid waste permitting staff plan on attending. So what is this, the short version?? 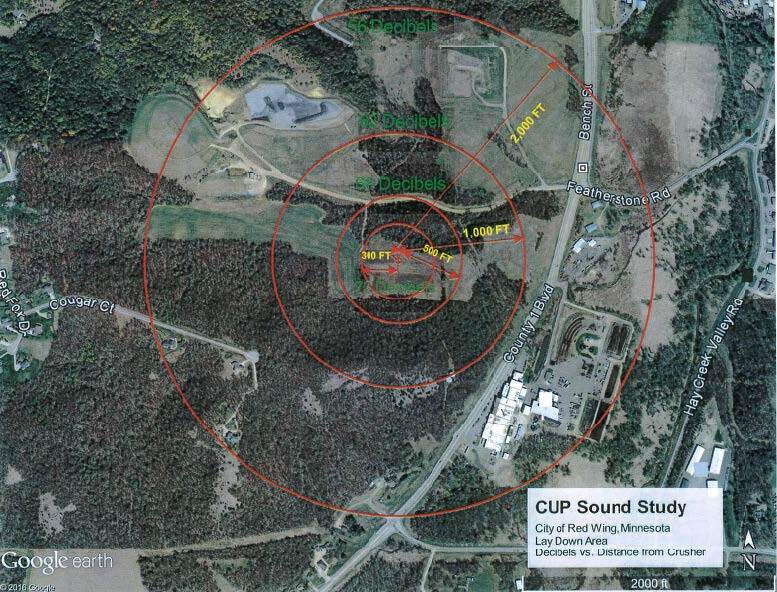 It’s a plan to “mine” the incinerator ash in the City of Red Wing landfill. There’s a link to formally closing the dump, and I think that by doing this, the city takes a step toward that formal closure, one pushed by the Minnesota Pollution Control Agency. But mining the ash? The plan is for the City of Red Wing to hire a company, Lab USA, to “mine” the ash and remove salable materials from it. The City staff has stressed the underlying Red Wing goal of landfill closure through the state’s “Closed Landfill Program.” When presented at the 11/9/2015 workshop (See 8c2-attachment -_11-09-15_Workshop_Minutes), there was “potential” for a sublease, and now that’s presumed. Red Wing’s Public Works has pressure from the MPCA to close its landfill, and also from Xcel because Red Wing “does not have enough ash to support this project as a stand alone project.” In other words, it’s dependent on Xcel to do this “project.” RW Public Works’s Moskwa admits that “the Xcel Energy landfill ash is the primary reason for the Lab USA’s interest in submitting a proposal.” (See p. 5, March 22. 2016, Sustainability Commission MeetingMinutes). The City of Red Wing project would last just 1 year, and Xcel Energy’s share would last 10-11 years. (Lease, p. 17 of pdf: May 9, 2016_9b – attachment) Yet the City of Red Wing is leasing Lots 1 and 2 from Xcel Energy for 20 years! Given that disparity, the reasons for the lease/sublease arrangement with the City of Red Wing, Xcel, and Lab USA, rather than Lab USA taking on the lease, are not clear. Because there are three parties in this, that provides some measure of inherent instability in the project, and because Lab USA has no history in Minnesota, they’ll receive higher scrutiny, one would hope. On the other hand, the City of Red Wing seems to have yet another deal with Xcel Energy, where they’ve taken on a lease of land from Xcel for the City yard (for what purpose?) and that also includes lease of the land for this project and then the City plans to sublease to Lab USA (for the one year, for 11 years, for 20 years? ), but yet the lion’s share of term of the project is the 10-11 years for Xcel, not the 1 year for Red Wing. So why is the City of Red Wing buying into this, subsidizing this, so heavily? To induce Xcel to do it? Some other reason? With the lease for both lots already signed, the project is moving forward, and that’s a problem. How is this a good deal for the City of Red Wing? Is anyone paying attention? Further, calling this project an allowed use, as “Public Works Maintenance Shops and Yards,” is a stretch. I’m not seeing any change from Agricultural Residential (AR) designation in the Comp Plan, and see statements that “Outlot A” was removed from the Tyler Hills PUD, Applications for Lot 1 and Lot 2 both denote Zoning as “AR.” I don’t see a change from AR to anything else. 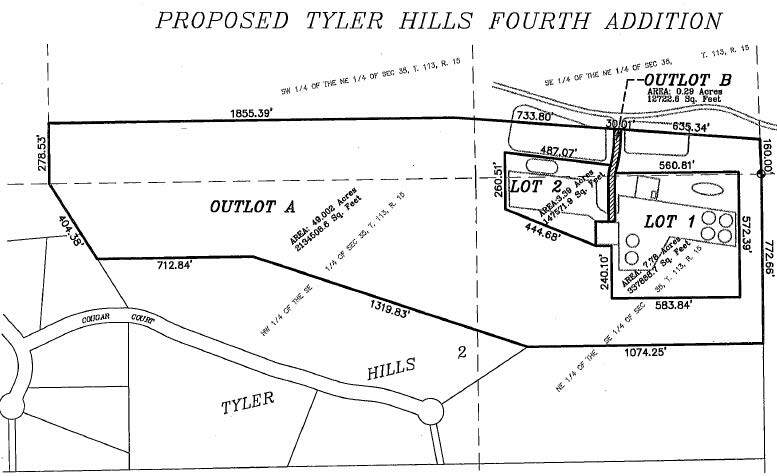 The Application includes “Proposed Tyler Hills Fourth Addition” and the lease boundary doesn’t match up with Outlot A, and Figures 1 and 2 don’t match up with the proposed plat. Details, anyone? Other issues with the project itself? There’s traffic… “24 trucks/day” means 48 truck trips per day, or 24 trucks assigned to the area to make many trips back and forth and back and forth from the landfill to the building — this needs to be clarified, and impacts addressed. And these trucks are in addition to currently running Xcel garbage burner ash trucks and in addition to RW’s Lot 1 “Public Works Maintenance Shops and Yards” trucks that will be at least an additional 15-30 pickups and trucks per day. There’s sound… The homes directly north, west, and southwest are above, with this project situated down in a hole — and sound travels up. The “CUP Sound Study” is for the RW crusher, and does not take into account the Lab USA operation, so how does the EAW address that? We need to take a look at that EAW (remember, it’s prepared by the applicant/project proponent) and see what is revealed, what is considered, and what’s left out.